Google Docs and Google Cloud Connect are registered trademarks of Google Corporation in the United States and other countries. TeamWork Live is a trademark of CollectiveSoft LLC. Copyright © 2019 CollectiveSoft LLC. All rights reserved. If you use Google Docs, you will be happy to know that you can now attach your Google Docs files to the items you create in TeamWork Live (i.e., milestones, tasks, documents, comments, and messages) and share them with your team members and clients just like regular files. To take advantage of Google Docs integration, you will need to first grant TeamWork Live access to your Google Docs account. Once access has been enabled, you will see the option to "Attach a Google Docs file" next to the regular "Attach a file" links. Clicking on the "Attach Google Docs file" link will open up a window that lists your Google Docs files and allow you to select a file to attach. You can attach both online files (i.e., Google Docs documents, spreadsheets, presentations, and drawings) as well as regular files (i.e., Microsoft Word, Excel, and PowerPoint files) that have been saved to your Google Docs account. Clicking on the link for an attached online file will open up the file in Google Docs. Clicking on the link for an attached regular file will download the file to your computer. TeamWork Live automatically handles the permission settings for the Google Docs files that you attach to TeamWork Live so that the appropriate team members and clients will be able to view or edit the files. You do not need to manually set the permissions in Google Docs beforehand. You simply need to ensure that you have permission to edit the permissions for the Google Docs files that you attach. Google recently released Google Cloud Connect, a Microsoft Office plugin that allows you to save your Microsoft Word, Excel, and PowerPoint files directly to Google Docs instead of having to save them to your computer and then manually uploading them to Google Docs. The plugin also backs up your file to Google Docs automatically each time you save the file in Office, which ensures that your Google Docs account will always have the latest version of your file. With TeamWork Live's integration with Google Docs, you can now take advantage of the time-saving features of Google Cloud Connect from within TeamWork Live. Any Office file that you have previously synced to your Google Docs account can be attached to a milestone, task, document, comment, or message in TeamWork Live. 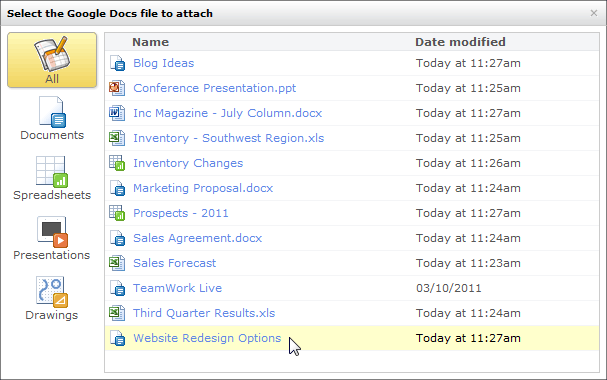 Your project members can download the attached file from TeamWork Live and edit it in their copy of Office. Any changes that your project member makes will be synced to your Google Docs account and to TeamWork Live. Using TeamWork Live with Google Docs and the Cloud Connect plugin allows you to ensure that you are always editing and sharing the latest version of your files with your team members and clients — all with much less hassle than ever before. Why do some of my files not appear in the Google Docs selection window? Only files that you are allowed to change the permission settings for are listed. Depending upon the permission settings, these are usually the files that you have created and files where you have been granted edit privileges. Once I attach a Google Docs file to TeamWork Live, is it okay for me to delete the file from Google Docs? No, if you delete a file from Google Docs, it will no longer be accessible from within TeamWork Live. Do project members need to have a Google Docs account to view the Google Docs files that I attach? No, project members do not have to have a Google Docs account to view an attached Google Docs file. They will need to have their own Google Docs account if they want to be able to edit them. Why can't a project member open a document I attached? You need to make sure that the permissions for the document is set to "Editors will be allowed to add people and change the permissions." in your Google Docs account. You can do this by selecting "Share... > Sharing Settings..." from the "Actions" menu for the file. What operating system does Google Cloud Connect currently support? Google Cloud Connect is currently available for Windows XP, Windows Vista, and Windows 7. Mac OS X is currently not supported due to limitations in Microsoft Office for Mac. Can you give me step-by-step instructions for being able to open a Microsoft Office document from TeamWork Live and then save the changes directly back to TeamWork Live without having to reupload the file? Make sure you have Google Docs integration enabled and that you have installed the Google Cloud Connect plugin. Please see above for instructions on how to do so. Start Microsoft Word, Excel, or PowerPoint once the plugin has been installed. If you have not already done so, setup the plugin by entering your Google Docs account information. You will need to do this only once. Create a document in Office and save it to your Google Docs account using the plugin. Sign in to TeamWork Live and click the "Attach a Google Docs file" link. Select the document that you just saved from Office. Once the document has been attached to an item in TeamWork Live, either you or a project member can download the file and edit it in Microsoft Office. As long as the plugin is installed, any changes that is made to the document will automatically be synchronized to your Google Docs account and to TeamWork Live.